I sat with a friend recently who was frustrated with a relative. I listened and then said, “It sounds like their extreme reaction to you is stealing your joy.” My friend teared up immediately. My comment had opened a place of vulnerability, of sadness, of a desire for something more, and a grief for what was unjustly taken. Later that day I sat with a question for myself. 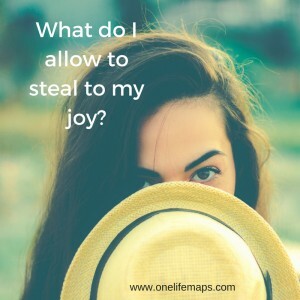 “What do I allow to steal to my joy”? Is it another person — their desire for power or control, or to simply be right? Is it comparison to others— as I look at others in real or virtual life and desire to have, to be, or to do something that I see in their lives? Is it fear, shame, or regret - as I look at my past, present or future? Is it insurmountable grief over a loss - of a loved one, a dream, a job? God desires that our stories be filled with joy. In fact, He promises a time when joy will never be stolen. Recognizing those places of stolen joy allows us to name more fully who we are in Christ. What do you allow to steal your joy? What new choices will allow you to take back your God-given joy?